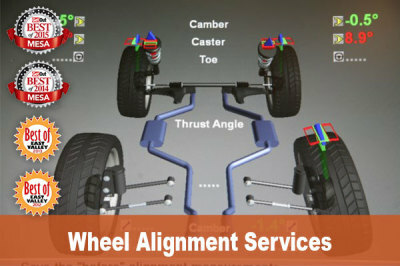 ​When it comes to suspensions and drivetrains, a problem in one area can be a symptom of a problem in another area. If you notice excessive wear on just one edge, it’s usually a sign that you have an alignment / suspension problem that a mechanic should handle. For that and other symptoms — like steering vibrations or pulling — you should have your steering and suspension systems inspected. The inspection should include: checking the power steering fluid, listening for unusual noises while the vehicle is in motion and a visual inspection of all major suspension and drivetrain components including the shocks, struts and springs.